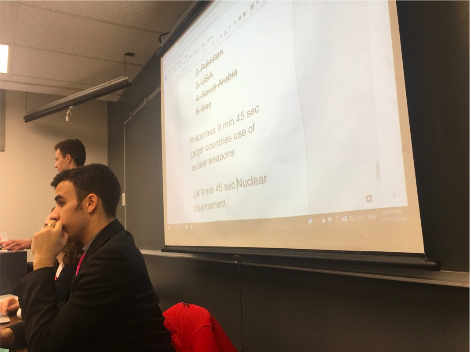 In the second session of Disarmament and International Security Committee, the delegate of Philippines stated that “Larger countries use of use of nuclear weapons”. China, the UK and South Africa all hold the opinion that the focus should be on reducing new production of nuclear weapons instead of limiting what we have now. It means that the nuclear weapons the world have now should be kept for protecting people in the war but new nuclear weapons should be prohibited from being developed. During the break time, the United States of American, the United Kingdom and Philippine were interviewed by China Daily. CD: What’s your opinion of reducing nuclear weapons? US: We think that it is necessary to reduce nuclear weapons but not in developed cuntries. We should impose this on smaller countries first and then bigger countries. CD: So how do we reduce the nuclear weapons in smaller countries? US: There are many ways to do, like political forces. P: We think it is important and we are working on it. CD: So what if bigger countries force you to reduce nuclear weapons? P: First we will fight against this, and we will ask them to do the same. CD: What’s your opinion on reducing nuclear weapons? UK: Yes it is what will help us a lot, so that we think we echo the opinion from China and South Africa. We should limit the nuclear weapons to protect the people in our planet. Older PostL’éducation: une arme clé contre le trafic humain?